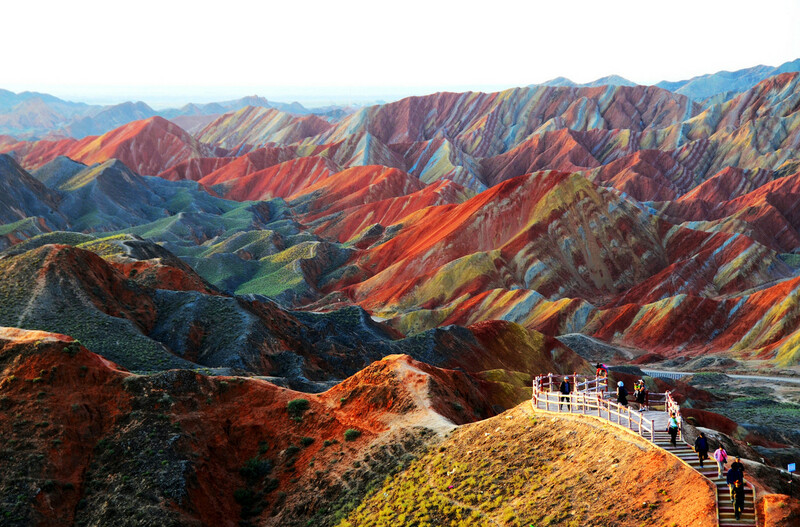 The otherworldly natural beauty of the rainbow mountains of Zhangye Danxia National Geological Park in China are the result of red sandstone and mineral deposits being laid down over 24 million years. Otherwise known as ‘the eye candy of Zhangye’ the national park is located close to the city of Zhangye in China’s northwestern Gansu Province. Best time of year to visit – June to September, when the combination of strong sun and little rain brings out the colours of the rock formations even more. Winter is not a recommended time of year for viewing. Zhangye is below freezing and very windy during this time. Best time of day to visit – morning and at dusk. Sunset is especially beautiful when the colours change constantly. It is recommended to try and visit on a sunny day, as only the sunshine will bring out the gorgeous colours of the mountains. If you can visit on the day after it has rained, even better. The rocky bands are well defined with colourful stripes and if it has rained the day before the colours will be even more stunning.